Location: Located on the S side of East Dock Road, on the East side of the Old Town Dock entrance. Prominently located on the East side of the A4042 roundabout. Constructed on the former Penner and Tilley wharves c1898. Formerly the premises of Phillip and Sons, Malsters, who operated a brewery in nearby Lower Dock Street. Now in use as auctionhouse and warehouse. Large, turn of the C19 floor maltings. Red brick, roofed in natural slate. Hybrid Ware/multi-storey type, consisting of 3 blocks, each elevation articulated by regularly repeating full-height brick pilasters rising to a cogged brick cornice. The NE block probably housed barley storage in the loft storeys, with growing floors below. It is 3 storeys high, with 3 loft storeys forming 6 storeys altogether in the gable end. Its long NW elevation is of 6 bays with regularly spaced small windows. The roof has 2 sets of gabled, four-light dormers, the lower set consisting of three, and the upper of two. The NE gable end is seven bays wide, with symmetrically aligned small windows. Central bay has projecting gabled pentice (over taking-in doors) rising through the fourth and fifth storeys. Central range incorporates three malting kilns beneath a single rectangular hipped roof at right angles to the NE and SW blocks. Three bays wide, stepping up to four storeys in height. Later two storey opening cut through central bay. Three small primary window openings at fourth floor level, now blocked. 3 square slate hung cowls on the ridge indicated the 3 kilns within. The SW block beyond the kilns probably formed a malt storage area, and is 3 bays wide and of double pile form with a single small opening to the central bay at fourth floor level, and later five light casement at extreme right hand end. Single storey vehicular opening to central bay at ground floor level. The twin gables of the SW elevation are rendered and of three bays each, rising to five storeys, each with a porthole window set high in the gable with three small openings beneath at fourth floor level. Listed Grade II as a very good example of a substantial late C19 maltings (of a type rare in Wales), retaining much of its original form and character. 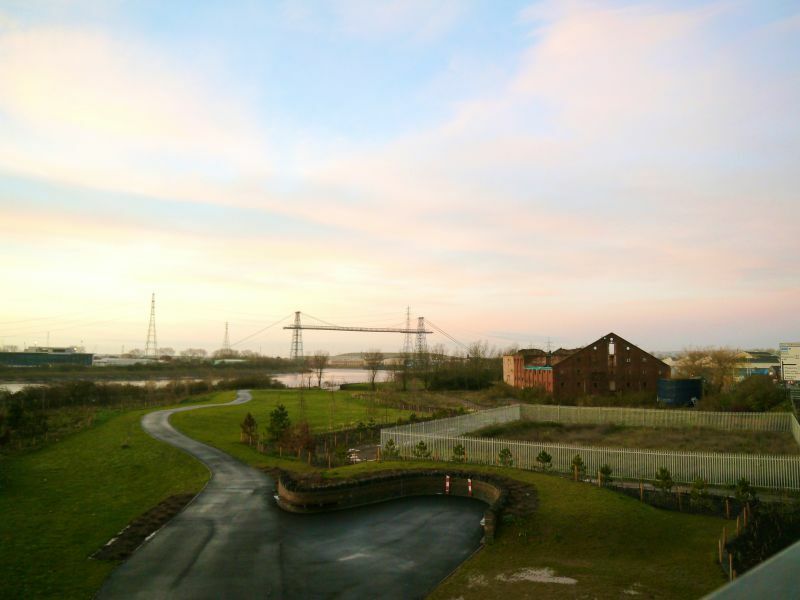 Group value with the Transporter Bridge.